The art and morality of the transcription was a hotly disputed question until very recent times; a climate of artificial purity in concert programming conveniently ignored the historical fact that virtually every Western composer since Pérotin has felt the necessity to use other men’s music, either to change the musical forces employed or to alter, embroider or vary the original material. Sense has prevailed, and even some of the more outrageous potboilers in the demi-monde of the virtuoso salon encore have gained perhaps even greater respectability in revival than they actually had as the Gebrauchsmusik of their day. No composer can ever have done more in the business of transcription than Liszt. Hundreds of piano pieces generically entitled transcriptions, paraphrases or fantasies fell from his pen over a period of more than fifty years. The degree of Liszt’s participation varies from that of the ‘conscientious engraver’, as he wrote himself in the preface to his Beethoven Symphonies, to that of the composer who merely uses a pre-existing theme to generate an almost entirely new work. 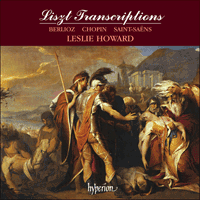 Naturally there are many intermediate varieties, and this first recording of transcriptions (and we shall continue to use that term for the sake of convenience) in the present series shows a broad range of Liszt’s methods.